A note in Case Logistix® is a text memo associated with a document. It can contain text you type, text you highlight in a document on the Mark-up tab, or a combination of both. Select the document in the Document List to which you want to add the note. 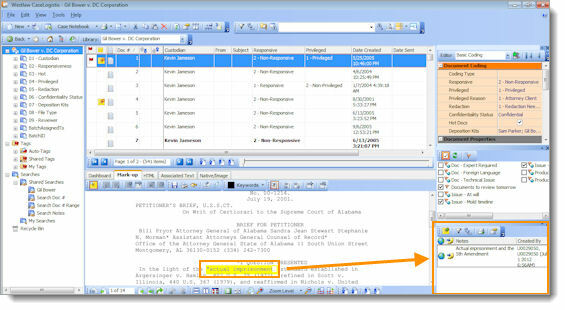 Click the Mark-up tab in the Document Viewer. Select the text in the document to which you want to add a note. On the Mark-up toolbar, click New Note. The Add/Edit Note dialog box is displayed with the selected text. You can accept the text as displayed, type new or additional text, or click Clean Up Note to correct the format of the text. Select the Private Note check box if you do not want the note available to other document reviewers. Click OK. 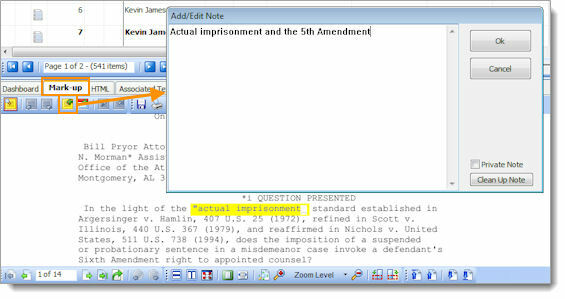 The selected text is highlighted in the document and the note is displayed in the right pane. On the Notes toolbar in the right pane, click the Create a New Note icon. The Add/Edit Note dialog box is displayed. Type the note in the box. Click OK. The note is displayed in the right pane.